This is a ribbon diagram of the TIR1 complex, a collection of proteins that acts as an auxin receptor. While messing around with iBooks Author, working on graphics and other media supplements for my book project, I noticed the ‘3D’ type of widget. I would love to be able to include a few structures of proteins in my project, so I started reading up on what kinds of files it supports. In short, it takes only 3D Collada files (short for collaborative design activity) and would allow the viewer to manipulate the structure on the iPad. Sounds great, but how do I make a 3D Collada (.dae) file? 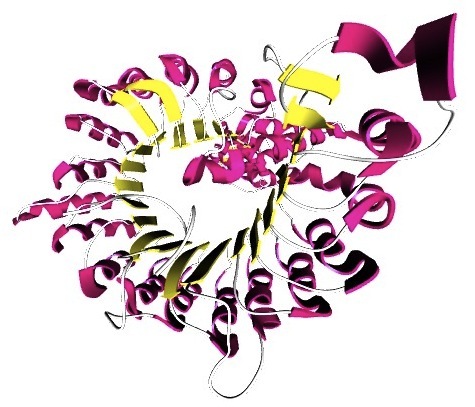 The standard for storing 3D data for biomolecules is the PDB file, short for Protein Data Bank, and available for download from sites like the Research Collaboratory for Structural Bioinformatics (RCSB) PDB. Pretty much every protein that has been crystallized has had its coordinates deposited as a PDB file there. The great thing about PDB files is that they are not static images, they are a set of instructions for drawing a structure, and therefore can be interactively manipulated if opened with the right software. The problem is, iBooks Author is not the ‘right’ software – it does not read PDB files. But fancy 3D modeling software like Maya or Blender, both of which export 3D Collada files, do not have a clue how to open a PDB file. Oh bother. A little searching around, though, led me to an open source plug-in called the embedded Python Molecular Viewer, ePMV. This nifty software loads within the fancy 3D modeling environment and gives you access to those PDB files. After installing the version of Blender from the ePMV site and enabling the plug-in, I could open PDB files and begin playing around with the many, many settings available for coloring, lighting, and displaying the structure. I have a lot to learn as far as using the software to customize all of these features, but at least I’ve successfully exported a Collada file and inserted it into my iBook project. Now that I have a way to use them, it’s time to think about which structures I want to include and where.